Do you feel overwhelmed when it comes to organizing your Craft Space? You're not alone. It's a big job, but you can do it! I'm in the process of redoing my Craft Room, so I thought that it would be fun to share the process with you. I did a series on How to Organize Your Craft Room in 2012. You can view them on YouTube Here. I was still learning the whole video process back then, so please excuse the quality. Step one is a step that you can use to organize any room in your house including your Craft Room. Sort your things into 3 groups: Keep, Give Away or Sell and Trash. Hint: Start small and work your way around your space. Tackle the first cabinet or bin, then go on to the next sorting into your 3 categories as you go. Now that you have gotten rid of a lot of things, you are ready for step two. Hint: Getting rid of things that you are not using is essential. Bless someone else or generate a little extra cash for you redo, but it is essential to move along the things that you are not using anymore. Step Two is to rethink how you are going to arrange your room. Even among the things that you are going to keep, some things (furniture and storage solutions), may be more useful in another area of your home. For instance, my old office chair is finding a new home in my husband's hunting blind. And that put a smile on Joe's face. Erase from your mind how it it used to be and envision a whole new space. Draw up a plan and go to Step Three. Now that you have your "big picture", begin working on how to organize smaller groups of craft supplies. Here's an example. Yesterday, I rethought how I was going to store my beautiful collection of ribbons. In my previous room it was all stored on my ribbon rack collecting dust or stuffed in a drawer long forgotten. My newer or current ribbons still have a home on my ribbon rack, because they are easily accessible and pretty. But the rest of my collection has been rerolled and is housed by color in trendy Mason jars that I found at my local Kroger Market Place. Now my beautiful ribbons are safe from dust and they have become part of my decor. How fun is that! And...I eliminated a whole lot of space gobbling ribbon rolls. Step Three is a process that may take a while, but it's worth the effort. Yahoo! Something new from Stampin' Up! Photopolymer stamps. What is this, you wonder? Well, it's a type of stamp where the actual stamp image is clear in addition to the block. We're starting off with one stamp set and we plan to offer a new one each month on a trial basis. We now offer options for every stamper; wood -mount, clear-mount, and now photopolymer. Excited? 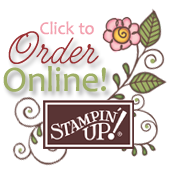 Watch this light-hearted video from Stampin' Up! After a lot of research, Stampin' Up! is introducing top-quality photopolymer stamps that have just enough give to create a perfectly stamped image every time and with the introduction of the new firm foam pads, let's just say that they are meant for each other!